So, I found another older score I should have posted to at the very least link to the Sky Shark link on the side of the page - where I made the loop and then some (died at the final boss in loop two). I set a high score then of 1,180,770 at area 199. It's no secret that I love this game and I did play afew credits the other night after taking a beating on Fire Shark and damn - it's so good. The Twin Galaxies high score is something like 3mil, which I have no doubt I could get after maybe a weekend of play as bullets get faster in subsequent loops, but good core patterns will stay the same. You just need to move tighter and quicker. It would be fun to have that record, but I have a feeling it would feel like an empty accomplishment due to the fact that there are a number of players who could and have beaten that score but never cared to submit to TG. Either way, it would be fun to see if I could do it - so who knows? Maybe just go for the counter-stop? You know, I actually gave Fire Shark a try a little bit of time after your last entry. Thanks to some of the dudes @ shmups forum for hooking me up with the sound samples, I was able to play it with sound in MAME. It's quite a nice sequel. I tried the Genny version and I was not impressed at all. Arcade is where it's at. 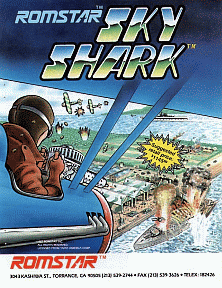 Seems a bit more difficult than Sky Shark but still very fun, and the music fits the game well, if not as melodic as Sky Shark's music. But, yes, Area 200 on in Sky Shark can be a pain. What gets me at that point is that the rotating turrets take very little time to turn towards your direction. And once they're aimed at you, they seem to have no problem with shooting at you right away. There are some little things to know about this behaviour to succceed in the 3rd loop that I haven't figured out yet. The game is so much fun that I've never bothered to save state practice the 3rd loop. I guess owning the board would be perfect for me... alas, some day. I like to put the game on the hard setting because the first loop can be kind of boring after you know how to deal with it. Game catches up to -a later loop- snuff only midway through the first loop. I do like the weapons in Fire Shark, they didn't screw up the "Shark" Formula too much by adding them. But added some weapon changing strategy... the fire weapon is balls powerful. I always enjoy reading the blog, cheers. Have you played P47 Aces? I've been really getting into it. 'Fraid it wouldn't be a great game to get the board for though, the difficulty is kind of silly memorizer hard. I haven't tried P47 yet, but I will keep it in mind. I am in the middle of getting another working MAME box together as my old one has started to bite the dust.